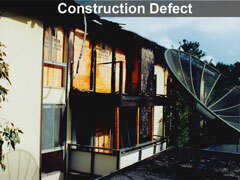 Consulting and Expert Testimony projects include accident reconstruction, failure analysis, and reporting. 90%+ court cases has been won with WCP&A's analysis and reports. We provides services in the San Mateo county and San Francisco bay area. During construction of the last of four multi-million-dollar residences in an exclusive neighborhood in the Oakland Hills, two landslides occurred downhill from this last residence. Closer inspection showed that the house had settled differentially 3 inches; its walls were cracked throughout; and, the entire soil mass on which it was built appeared to be moving. We investigated this loss and determined that numerous construction defects had lead to the present situation: the subsurface drainage functioned improperly; the storm drain beneath the street sloped uphill and filled with silt thus rendering it ineffective; the soil mass was an old landslide that had not been repaired correctly; and the piers beneath the residence did not extend into bedrock. This multi-million dollar residence was nearing completion when extensive leaks and deterioration of all metal fasteners and plumbing were discovered inside every exterior wall of house. We inspected the residence, documented all of its damage, worked with a nationally known chemist and wood expert to determine the cause of the extraordinary levels of damage, identified the design & construction defects that lead to the extensive leaking and structural weakness, designed a repair, solicited bids for the repair, and prevailed in litigation for the full replacement cost of the residence. We investigated the accident and determined that the ladder provided by Stone Cheney for Mr. Alvarez to access the roof was defective, too short to be used properly, and not tied to the building properly. We determined that absent these deficiencies, Mr. Alvarez would not have fallen. And we determined that Stone Cheney had alternate means for providing Mr. Alvarez access to the roof. Leland Fielding, his brother Timothy, and two of their friends were playing in an open gas-pipe trench excavation when the sides of the trench collapsed on them. Timothy and two of the boys managed to free themselves, but Leland remained trapped by the dirt. He died while his mother and brother tried to free him from the trench. We investigated this accident and determined that the trench was in a public right-of-way. It was not properly shored or protected in any way to prevent a collapse. No precautions were taken to keep pedestrians from entering the site – including children walking from neighboring residences to their local school. No alternate travel path was provided for pedestrians. Children were known to play in the construction zone. Cars and construction vehicles were allowed to travel adjacent to the trench in such a manner that they could precipitate a collapse. And the trench was not protected to prevent entry into it. Mr. Wise was filling his water truck while double-parked near at a fire hydrant on a construction site in Pleasanton. As he was putting away his filler hose behind his truck, a second water truck ran into the back of his water truck and severed his leg between the two truck bumpers. We investigated and reconstructed this accident. First, we showed that the power steering failed on the second water truck. Next, we showed that once the power steering failed, the second truck was unable to maneuver and there was not enough time for it to stop before impact. We determined that the location of the incident was in fact city-owned roadway and that the California motor vehicle code applied. We determined that Mr. Wise’s employer had instructed him to park illegally in order to fill his water truck. And we determined that the second water truck was not being independently operated – instead, it was being operated under the direction of the general contractor on the job site. Mr. Sandoval was in the process of attaching a pile driver to the tip of a crane boom as it lay on the ground between two freeway overpasses in Mountain View, CA. Unexpectedly, the crane operator started to raise the boom tip. Mr. Sandoval jumped from the boom and broke his arm. Mr. Sandoval claimed that the accident was caused by inadequate lighting, inadequate communications, and an inability of the crane operator to see what was happening. 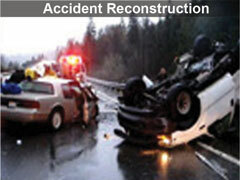 We investigated & reconstructed this accident; this included a detailed lighting and visualization study. We inspected incident scene at night and measured available lighting levels with and without similar construction lights. We created 3D models of the scene with photo-realistic lighting using ray-tracing technology. We analyzed luminance and illuminance based on test data. And we determined that the crane operator had a perfectly clear view of the situation and had reacted properly to hand-signals given by Mr. Sandoval’s foreman. Ms. Dillard broke her ankle while exiting a Bank of America lobby in San Jose. She claimed that she tripped on obstructions on the floor. We created a 3-D computer model of the lobby, matched it to the security video tape, and demonstrated that Ms. Dillard could not have tripped over any obstructions because none were present. We also demonstrated that she had a torsional fracture of her leg that was caused by Ms. Dillard planting her foot in one direction, twisting on this planted foot as she turned, and breaking prior to her fall. This was support by the medical evidence and experts. Mr. Blanco was driving northbound in the number 2 lane of Highway 101 south of Salmon Creek overpass on a rainy afternoon when he lost control of his truck. He slid across 4 lanes of traffic into the guardrail on the western side of the highway. Ms. Holly drove her car into the side of Mr. Blanco’s truck and was severely injured. WCP&A reconstructed this accident and demonstrated that substandard roadway drains, grading, and shoulder width caused a temporary pond in the number two lane after a 10-year-recurrence-period 15 minute rain storm; this pond caused Mr. Blanco’s truck to start hydroplaning. We also demonstrated that a substandard cross slope to the highway allowed sheet flow of water down the highway instead of to the shoulder & gutter; this prevented Mr. Blanco’s truck from regaining steering control. We also demonstrated that Mr. Blanco was not exceeding the speed limit, the main storm had passed, and only light rain was falling at the actual time of the accident. An accident at a construction site in the San Francisco Dogpatch neighborhood sent four workers to the hospital. During a concrete pour, a drop in the falsework deck was noted. Four carpenters responded to the incident and were working to raise the deck to its finished elevation when the deck collapsed, causing three workers to fall down a stair shaft between 10 to 30 feet and sustain multiple injuries. WCP&A was hired to investigate and analysis this incident. 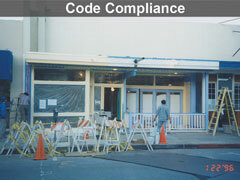 This was an inspection and analysis project for a residence built on the Cupertino hillside. A landslide occurred, and a retaining wall was destroyed.